‍‍‍In the current economic context, we all need to spend money to purchase basic things. But it is often overlooked how, while out shopping, we can all assist in creating a better world through the simple choices we make. By supporting the “redirection of the flow of capital” to ethically rated businesses which do not lobby against progressive climate or social-economic policies, which do not partake in deforestation or human rights abuses, and which do not support “profit over human and environmental flourishing”, it is possible for us to assist the transition to a more just society. That is why with your help the hope of The Good Shopping Guide is to make a positive difference to the environment, to animal welfare and to communities across the globe, by helping people make informed decisions about which companies and brands are best for the planet, best for animals and best for people world-wide. We don’t have to feel powerless about the world’s problems. Our till receipts can also be like voting slips – they can be used constructively by turning the notion of “money is power” on its head. This is something that the big corporations will have to notice tomorrow, even if they seem to be unaware of it today. If you care about global warming, pollution, animal testing, factory farming, the arms trade and the exploitation of people, you are certainly not alone. More people are taking an interest in the origins of their purchases, and where their money goes. What companies is your money supporting and how ethically responsible are these companies, are just a few questions now frequently being asked. People are realising that they don’t have to join a campaign or become a political activist to make their voices heard: speaking out can also be as easy as making good choices about where you shop and what you buy. These choices can support progressive companies who want to improve the way their business is done. Our shopping habits can force changes in the day-to-day workings of even the largest corporations. It’s already happening in supermarkets, where fair trade, GM-free and organic foods are appearing in larger numbers because the companies know that these products will be sought out by more and more of their customers. Now, more than ever before, people are choosing to use their spending power pro-actively. The information on this site can empower us all to really make a difference to the world around us. The big companies have noticed this too, and have begun to pursue the ‘halo’ effect that comes with an association with these types of product. One of the most widely criticised brands, Nestlé now has its own fair trade Partners Blend coffee. L’Oreal’s controversial acquisition of The Body Shop, and Green & Black’s take-over by Cadbury, might provide an opportunity for their ethical business principles to filter up through the company groups. As an individual, you can make a difference in lots of ways. 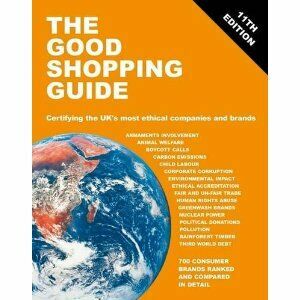 Begin by looking for products carrying ‘The Good Shopping Guide – Ethical Company’ or our ‘Ethical Award’ logos. Also look for fair trade, organic and GM-free foods. You could also choose to buy sustainably produced or recycled products. Buying eco friendly cleaning fluids or washing-up liquids gives progressive and ethical manufacturers more funds to invest in clean technology, and helps to persuade other manufacturers to consider changing their policies. Each of these decisions has an impact: small in itself but huge overall when millions of others are doing the same. This site shows that you can be part of the solution, rather than part of the problem. It provides all the information you need to make your shopping decisions the first step towards a cleaner, fairer and kinder world. ‘Good’ shopping is ethical shopping. This means buying products that are made in an ethical manner by companies who do not cause harm to or exploit humans, animals or the environment. Ethical shopping encourages innovative products and companies, and discourages others that prefer to ignore the social and environmental consequences of their practices. It also empowers you, the individual, by giving you a say in how the products you buy are made and how the manufacturers conduct their business. Our choices can be both positive, by buying products that we know to be ethical, and negative, by refusing to buy the ones of which we disapprove. For example, one aspect of ethical shopping might be supporting actions such as the Nestlé boycott, which targeted all the brands and company subsidiaries to try and force the company to change its marketing of formula baby milk in the Third World. With this, your ethical comparison site, you will be able to follow a fully screened approach. This means looking at all the companies and products together and deciding which brand is the most ethical. It is this information that The Good Shopping Guide brings together in the following pages of this site. The Ethical Company Organisation is part of an ever-growing network of organisations committed to making the world a better place: groups such as Oxfam, Fairtrade Foundation, Traidcraft, Friends of the Earth, Naturewatch, the Soil Association, the Vegetarian Society and the Forest Stewardship Council. Their work helps to put pressure on governments, whether directly or indirectly, to use legislation to make ethical trade not just a choice, but a fundamental part of the way we do business. By using this site you will discover more than you ever knew about what goes into the goods you buy. You will have the information you need to make clear and informed decisions, either to choose the products of green and progressive companies or to boycott those of unethical companies. From here on, it’s up to you.